'When her son dropped out, she dropped in.' Academy Award winning actress Helen Hunt returns to the big screen in the coming-of-age comedy Ride, which finds her rediscovering herself while learning to take on the ocean. We have the first poster for this funny and heartbreaking release, heading to theaters just in time for summer. Helen Hunt is wet suited up, and ready for the next big wave life has to offer. In Ride, when an editor from The New Yorker (Helen Hunt) follows her son (Brenton Thwaites) to LA after he drops out of college to surf and find himself, she ends up being the one thrust into a sea change of self-discovery. In this comedy written and directed by Helen Hunt, she befriends a limo driver (David Zayas), rediscovers her sexuality with a younger surf instructor (Luke Wilson), and begins to heal her fractured relationship with her son and herself. 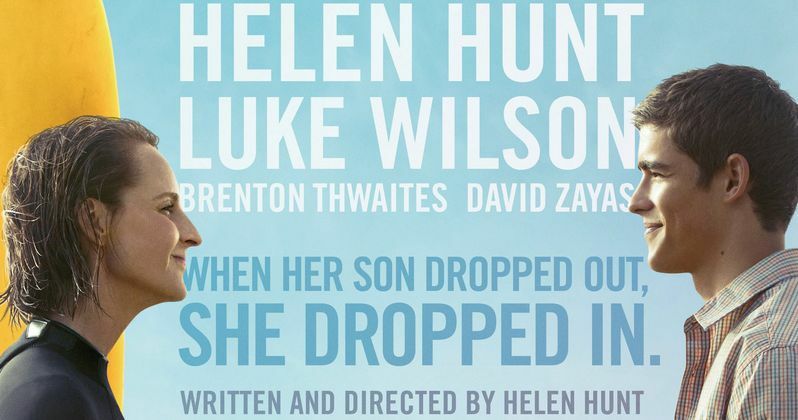 Brenton Thwaites appears with Helen Hunt on our exclusive one-sheet, in anticipation of the movie's May release. We also have a photo that finds Helen Hunt walking the beach with her board, about to take on an ocean of new experiences. To learn more about the film, you can visit the Ride Facebook Page. And if you like what you see, be sure to drop Helen Hunt kind words on her personal Facebook page!